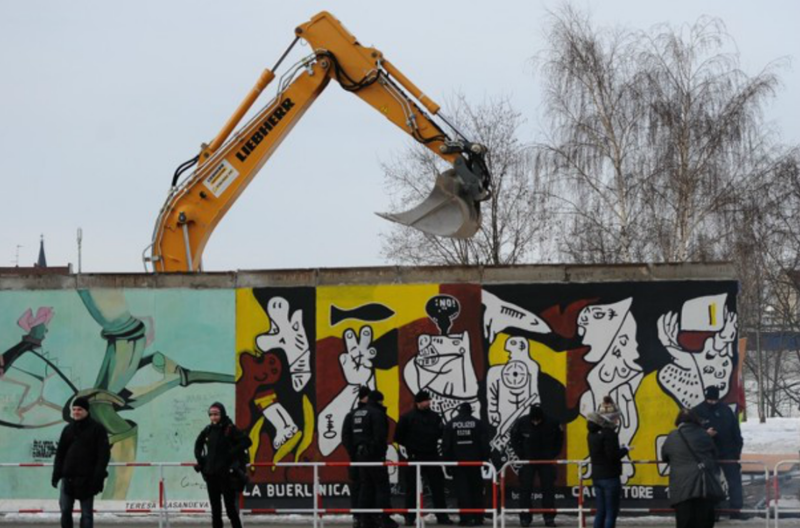 The “Anti-Fascist Protection Rampart,” aka The Berlin Wall, perhaps the preeminent icon of the Cold War, came down officially in 1989. Photographs at the time featured throngs of individuals standing on the wall and around it, many using hammers and pick axes to destroy it. Images of large scale demolition followed and as time has passed we have seen photographs of the wall converted into relics of a distant time and place—who would like to buy a piece of the wall for display in their living room?—or of specific locations such as the famous Checkpoint Charlie paved over with hot dog stands and tourist attractions. 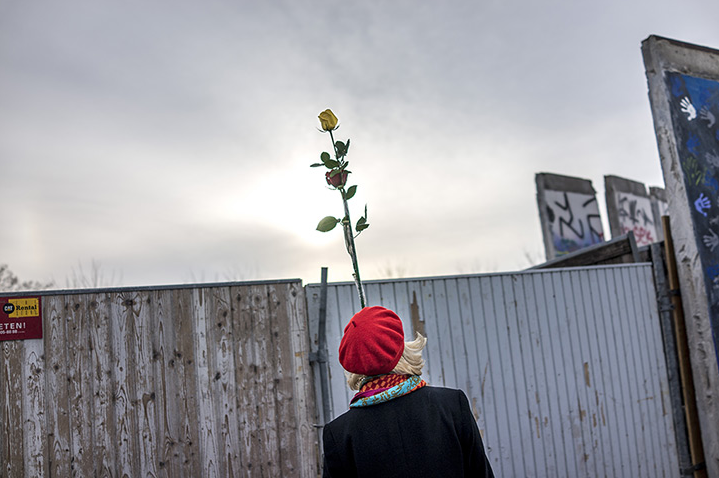 The largest remnant of the wall is a nearly mile long section along the Spree River known as the East Side Gallery on which artists have painted murals—105 paintings in all—marking Germany’s history and the movement to freedom that culminated in 1989. It is by some accounts the largest outdoor gallery in the world and something of a memorial to its own creation, its vibrant colors a marker of individualism and freedom and a stark contrast to the drab gray of the walls that it covers and which served as the institutional aesthetic of the Soviet Bloc authoritarian political culture that it supplanted. But alas, the forces of progress known no bounds, as in the recent image above in which heavy industrial equipment is being used to eliminate a large section of the wall to make way for an access road to luxury apartments that are being built nearby. Where once “the people” thronged to tear down a drab, authoritarian wall in the name of democracy—and, one might assume, the ideology of free markets—the forces of democracy and free markets now conspire to eliminate the colorful vestiges of the freedom that animated it in the first place. And so we have the photograph below.